I can't wait to show you this week's Simply Stampin' Up! project! This new, weekly feature on my blog has been so fun for me - I hope you are enjoying it too. There are so many fabulous project ideas out in the crafting world, I love being able to transform them into All Stampin' Up! using our top quality products for these gorgeous designs. 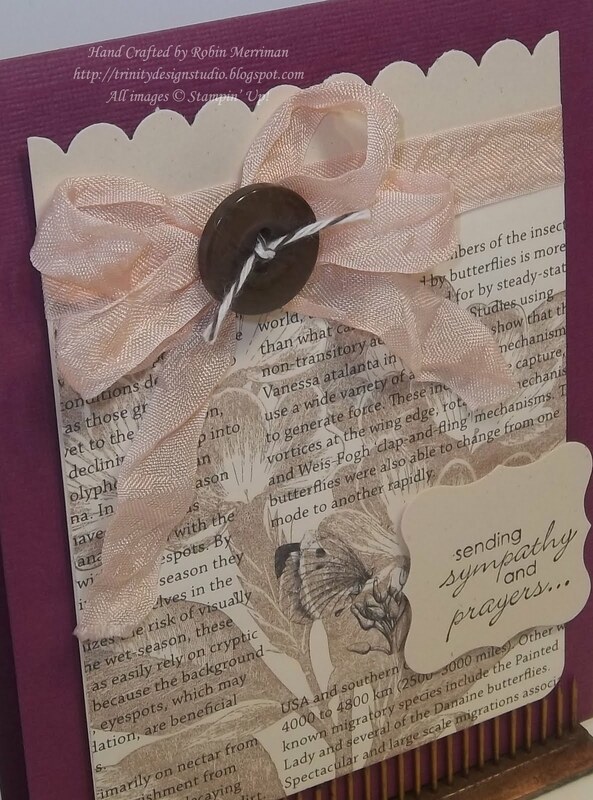 The biggest change I made was the greeting, but that was a personal decision as a dear friend from church passed away this week and I needed a sympathy card for his family. Which just goes to show that many cards can fit many occasions by simply changing out the greeting. So, are you ready to put it all together? Great! Let's get started! Layer 1: I cut Rich Razzleberry Textured cardstock at 4 1/4" x 11" and folded it in half to make a standard A2 card. Layer 2: This layer is actually 2 in 1 since my Designer Paper is adhered to my cardstock layer. I cut a piece of First Edition Designer Series Paper at 3 1/2" x 3 3/4". 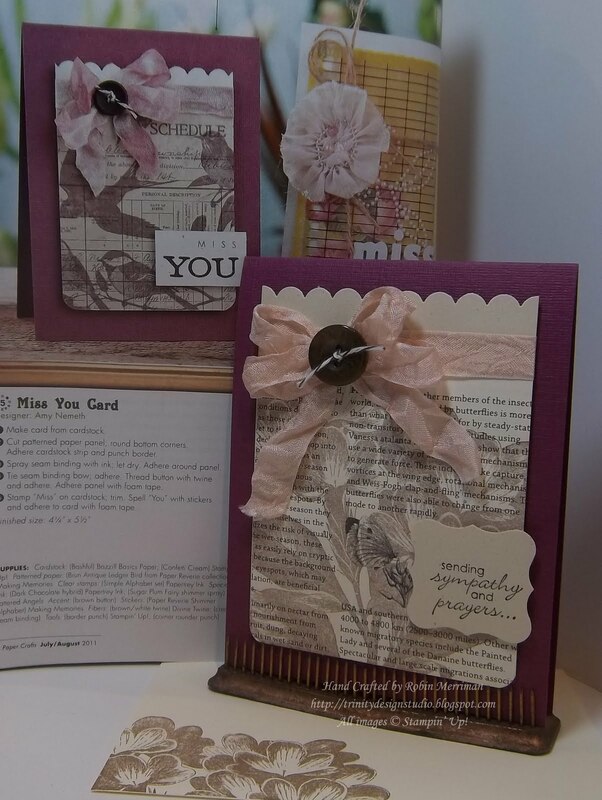 Next I inked up the NEW, and may I say FABULOUS, Sweet Floral Background stamp with Soft Suede Classic Ink. I smoothed the ink out with my Brayer and stamped the image onto my paper. **TD Tip - When working with Background stamps, I find that it's so much easier to lay the stamp on it's back (wood side down on the grid paper) to not only ink it up, but to stamp the image. I ink up the stamp first, using a Brayer to smooth it out if there are lines from the ink pad. Next, I carefully place the cardstock or paper on the inked stamp. I hold it in place and gently fold over the side of my Grid Paper, covering the stamp. Always using one finger to hold the cardstock in place, I gently rub all over the stamp through the Grid Paper to transfer the image to the cardstock. Then I peel back the Grid Paper and remove the stamped cardstock. the beauty of this technique? NO inky fingers! If you haven't tried this method, I recommend it. It will change the way you think about your background stamps - they will become your best friend! So, back to Layer 2! Next, I adhered the stamped Designer paper to a piece of Naturals Ivory Cardstock cut at 3 1/2" x 5". I took out my Scalloped Edge Border Punch and punched across the top of this layer. Using my Corner Rounder punch, I rounded the bottom two corners. Embellishments: Let's talk about that awesome bow! I have to admit, one of the reasons I was drawn to the card in the magazine was the ribbon treatment. I loved the crushed, shimmery ribbon and knew I wanted to re-create this look with our Seam Binding. To get there, I cut a length of Very Vanilla Seam Binding 24" long. Next, I took one of SU! 's large plastic stamp set boxes and placed the ribbon in it with a little bit of water and about 5 drops of Blushing Bride Classic Re-inker. I mixed the water and re-inker together on one end of the box and then pushed the ribbon into it to soak it up. For a minute or so, I simply crushed and squished the ribbon around, opening it up and re-crushing it into a ball. I eventually placed it in a folded paper towel to soak up most of the moisture and then I finished drying it with my hair dryer. I did not use my Heat Tool because I feared that the intense heat would melt the ribbon. This seems like a long process from the description, but it really only took about 10 minutes total. If I had colored the ribbon before I started the project, I could have eliminated the hair dryer, but I'll know that for next time, eh? I LOVE it! I took a small portion of the seam binding and wrapped it around the Layer 2 panel, securing it on the back with SNAIL adhesive. I then tied the double bow and added the Early Espresso Neutrals Button by tying it around the bow with Early Espresso Baker's Twine. It was adhered to the card front with Mini Glue Dots. The greeting is from the new Petite Pairs Stamp Set. I can see that this will quickly become one of my favorites! I stamped the greeting on a scrap of Naturals Ivory cardstock with Early Espresso Classic Ink and punched it out with the Curly Label Punch. It's adhered to the card front with Stampin' Dimensionals. 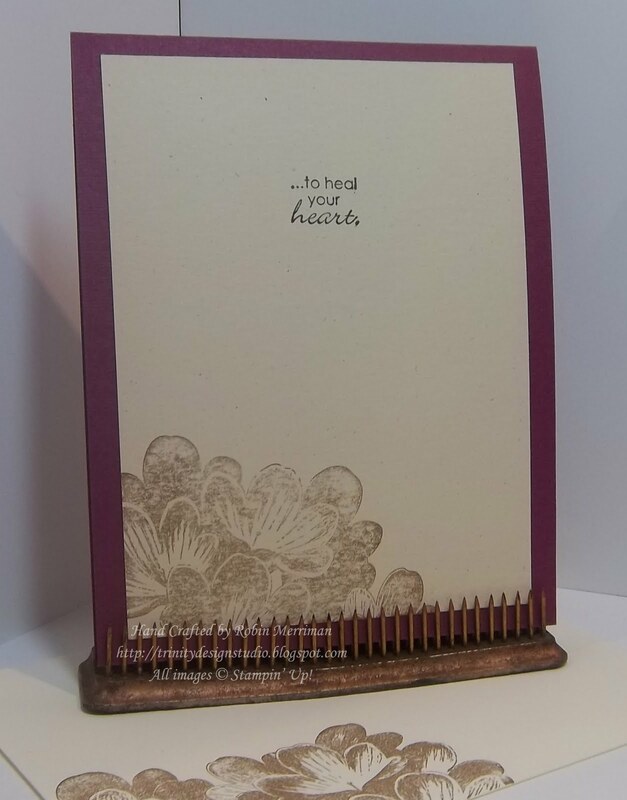 After finishing the greeting, I added the entire front panel to the card front with more Stampin' Dimensionals and that part was done! I inked up the Sweet Floral Background Stamp once again with Soft Suede Classic Ink and stamped a bit of it in the lower left corner of the Naturals Ivory inside panel. I repeated this on the Very Vanilla envelope. The greeting on the inside is simply the second part of the sympathy greeting from Petite Pairs, again, stamped in Early Espresso. So stampers, there's your card for today! Are you ready to go use your background stamps? Dye and crush some ribbon? Awesome! Go for it! And if you need or want any of the supplies I've used here today, you can shop my Online Store anytime, 24/7. I've included a supply list for you at the bottom of this post to make it easy for you! Have a great day stampers, and oh, yes - don't forget - the $99 Demonstrator Kit special that I talked about yesterday only goes for 4 more days including today. Don't miss it if you're on the fence, ok? 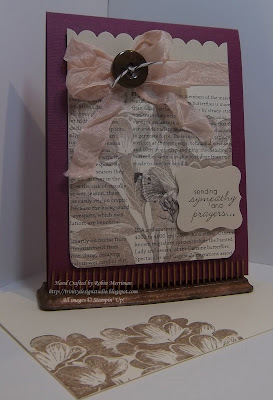 Check out my stampin' story that I shared here yesterday. Just BEAUTIFUL Robin! And I just know it will be greatly appreciated. Absolutely beautiful. I am really enjoying this series. Thanks so much for the inspiration. Awesome card. LOVE the ribbon/bow!